Author of "As a Man Thinketh"
James Allen is a literary mystery man. His inspirational writings have influenced millions for good. Yet today he remains almost unknown...... None of his nineteen books give a clue to his life other than to mention his place of residence - Ilfracombe, England. His name cannot be found in a major reference work. Not even the Library of Congress or the British Museum has much to say about him. Who was this man who believed in the power of thought to bring fame, fortune and happiness? Or did he, as Henry David Thoreau says, hear a different drummer?...... James Allen never gained fame or fortune. That much is true. His was a quiet, unrewarded genius. He seldom made enough money from his writings to cover expenses. Allen was born in Leicester, Central England, November 28, 1864. The family business failed within a few years, and in 1879 his father left for America in an effort to recoup his losses. The elder Allen had hoped to settle in the United States, but was robbed and murdered before he could send for his family. The financial crisis that resulted forced James to leave school at fifteen. He eventually became a private secretary, a position that would be called administrative assistant today. He worked in this capacity for several British manufacturers until 1902, when he decided to devote all his time to writing. 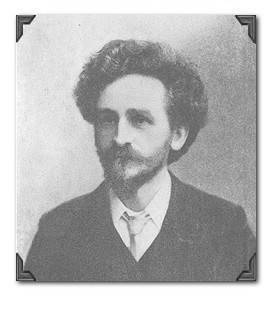 Unfortunately, Allen's literary career was short, lasting only nine years, until his death in 1912. During that period he wrote nineteen books, a rich outpouring of ideas that have lived on to inspire later generations. Soon after finishing his first book, From Poverty To Power, Allen moved to Ilfracombe, on England's southwest coast. The little resort town with its seafront Victorian hotels and its rolling hills and winding lanes offered him the quiet atmosphere he needed to pursue his philosophical studies. As A Man Thinketh was Allen's second book. Despite its subsequent popularity he was dissatisfied with it. Even though it was his most concise and eloquent work, the book that best embodied his thought, he somehow failed to recognize its value. His wife Lily had to persuade him to publish it. James Allen strove to live the ideal life described by Russia¹s great novelist and mystic Count Leo Tolstoy - the life of voluntary poverty, manual labor and ascetic self-discipline. Like Tolstoy, Allen sought to improve himself, be happy, and master all of the virtues. His search for felicity for man on earth was typically Tolstoyan. His day in Ilfracombe began with a predawn walk up to the Cairn, a stony spot on the hillside overlooking his home and the sea. He would remain there for an hour in meditation. Then he would return to the house and spend the morning writing. The afternoons were devoted to gardening, a pastime he enjoyed. His evenings were spent in conversation with those who were interested in his work. A friend described Allen as a frail-looking little man, Christ-like, with a mass of flowing black hair...... I think of him especially in the black velvet suit he always wore in the evenings, the friend wrote. He would talk quietly to a small group of us then - English, French, Austrian and Indian - of meditation, of philosophy, of Tolstoy or Buddha, and of killing nothing, not even a mouse in the garden. He overawed us all a little because of his appearance, his gentle conversation, and especially because he went out to commune with God on the hills before dawn. James Allen's philosophy became possible when liberal Protestantism discarded the stern dogma that man is sinful by nature. It substituted for that dogma an optimistic belief in man's innate goodness and divine rationality. This reversal of doctrine was, as William James said, the greatest revolution of the 19th Century. It was part of a move toward a reconciliation of science and religion following Darwin's publication The Origin of Species. Charles Darwin himself hinted at the change in belief in The Descent of Man. In that book he wrote, the highest possible stage in moral culture is when we recognize that we ought to control our thoughts..
Allen's work embodies the influence of Protestant liberalism on the one hand and of Buddhist thought on the other. For example, the Buddha teaches, All that we are is the result of what we have thought. Allen¹s Biblical text says, As a man thinketh in his heart, so is he. Allen insists upon the power of the individual to form his own character and to create his own happiness. Thought and character are one, he says, and as character can only manifest and discover itself through environment and circumstance, the outer conditions of a person's life will always be found to be harmoniously related to his inner state. This does not mean that a man's circumstances at any given time are an indication of his entire character, but that those circumstances are so intimately connected with some vital thought element within him that, for the time being, they are indispensable to his development. Allen starts us thinking - even when we would rather be doing something else. He tells us how thought leads to action. He shows us how to turn our dreams into realities...... His is a philosophy that has brought success to millions. It is the philosophy of Norman Vincent Peale's The Power of Positive Thinking and of Joshua Liebman's Peace of Mind. We become spiritually rich, Allen writes, when we discover the adventure within; when we are conscious of the oneness of all life; when we know the power of meditation; when we experience kinship with nature. Allen's message is one of hope even in the midst of confusion. Yes, he says, humanity surges with uncontrolled passion, is tumultuous with ungoverned grief, is blown about by anxiety and doubt. Only the wise man, only he whose thoughts are controlled and purified, makes the winds and the storms of the soul obey him. Tempest-tossed souls, Allen continues, wherever you may be, under whatsoever conditions you may life, know this - in the ocean of life the isles of blessedness are smiling and the sunny shore of your ideal awaits your coming. And thus Allen teaches two essential truths: today we are where our thoughts have taken us, and we are the architects - for better or worse - of our futures. The works of James Allen are eminently practical. He never wrote theories, or for the sake of writing, or to add another to the existing books. According to his wife, Allen wrote when he had a message, and it became a message only when he had lived it in his own life, and knew that it was good. Thus he wrote facts, which he had proven by practice. "As a Man Thinketh" by James Allen - A set of philosophical musings on the power of our thoughts. One of the best-known books of this kind. "Above Life's Turmoil" by James Allen - In this book Allen dissects the human condition and like a master physician, he offers solutions in his haunting and truthful style. "Byways to Blessedness" by James Allen - A very inspirational and popular title. Right Beginnings; Small Duties and Tasks; Standing Alone; Understanding the Simple Laws of Life; and much more. "The Way of Peace" by James Allen - As the effect is related to the cause, so is prosperity and power related to the inward good, and poverty and weakness to the inward evil. "Love Does Not Judge" quote..
"The Path of Prosperity" by James Allen - Contents: Lesson of Evil; Way out of undesirable conditions; silent power of thought; Realization of prosperity; Secret of abounding happiness; Secret of health, success, and happiness; and much more. As A Man Thinketh, Also Available in the Masters Collection, with 7 other Famous Authors, like Napoleon Hill, Russelll Conwell, Charles Haanel, Wallace D. Wattles and others. I have recently discovered the titles of several other books by James Allen and fortunately for all of us, they are still in print. All of these may be purchased directly from, or ordered through your normal book retailer. In addition, there is a "Wisdom of James Allen" collection available from Amazon.Com.